The homing instinct in birds and animals is one of their most remarkable traits: their strong local attachments and their skill in finding their way back…It seems at times as if they possessed some extra sense—the home sense—which operates unerringly. 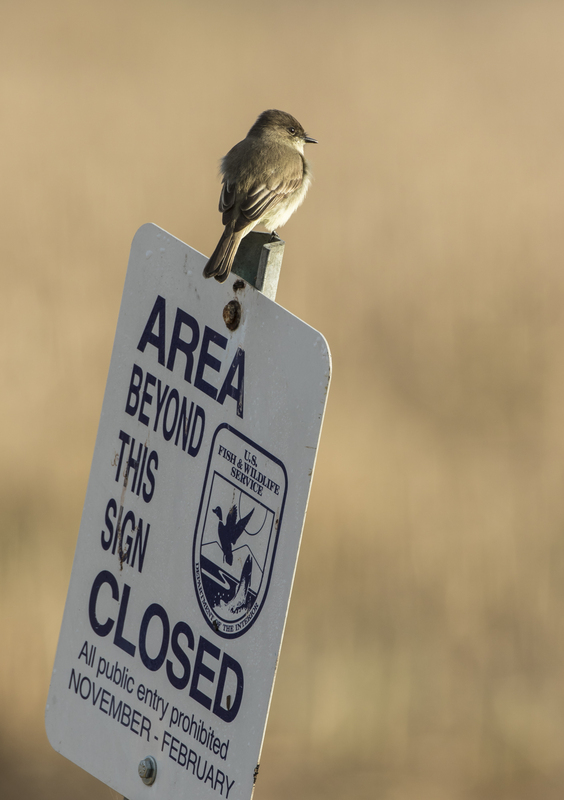 Last weekend we managed to escape for a couple of days and head down to our favorite spot, the Pungo Unit of Pocosin Lakes National Wildlife Refuge. My friend, Michael, had been sharing images of the many bears he was seeing feeding in the cornfields on the refuge, and it finally got to me, I had to get down there! We were met at the refuge by some new friends that understand the power and beauty of wild places and the creatures that call them home. Though seeing bears was the goal, we were all open to whatever the refuge cared to share, so we were delighted to find the first swans of the season already on the lake. When we drove up to the impoundment known as Marsh A, there they were, hundreds of graceful white forms, filling the crisp air with their mellow sounds. We stopped, watched them for several minutes, quietly taking it all in and appreciating the fact that these birds had just completed an amazing journey of 3000 miles or more to spend the winter here. It is reassuring that these natural rhythms continue, that the natural world has some order to it, even when much of what we hear on the news does not. On to “Bear Road” where we saw several people parked at the gate and sitting along the road waiting for an appearance by one of the area’s many resident bruins. 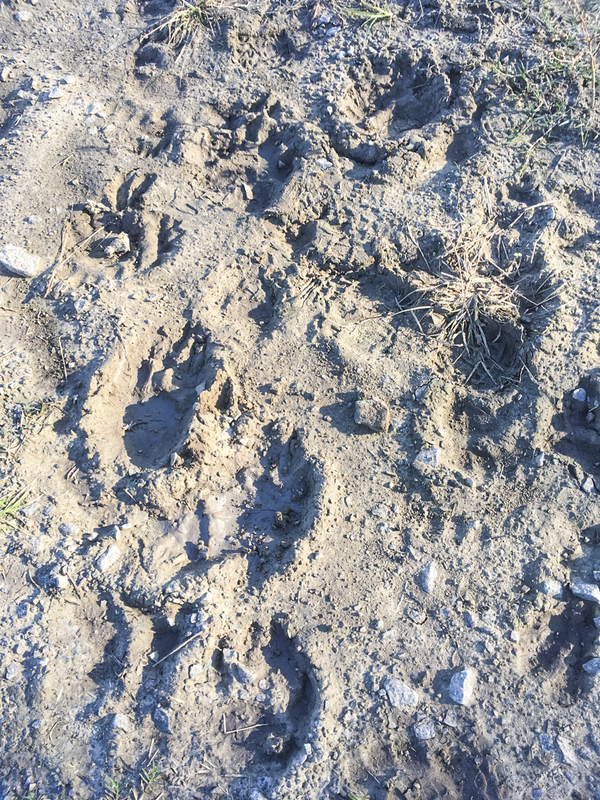 The tracks in the hardened mud tell the story…frequent comings and goings from the dense woods to the local feed store, the cornfield across the road and canal. With a small crowd of photographers hanging out near one of the main bear crossings, we decided to walk on down the road, away from the chatter, and experience a little quieter part of the scene. Quiet, except for the sounds of swans and Canada geese coming from the lake a short distance through the woods. We soon saw our first of many bears across the open field at the edge of a patch of woods. 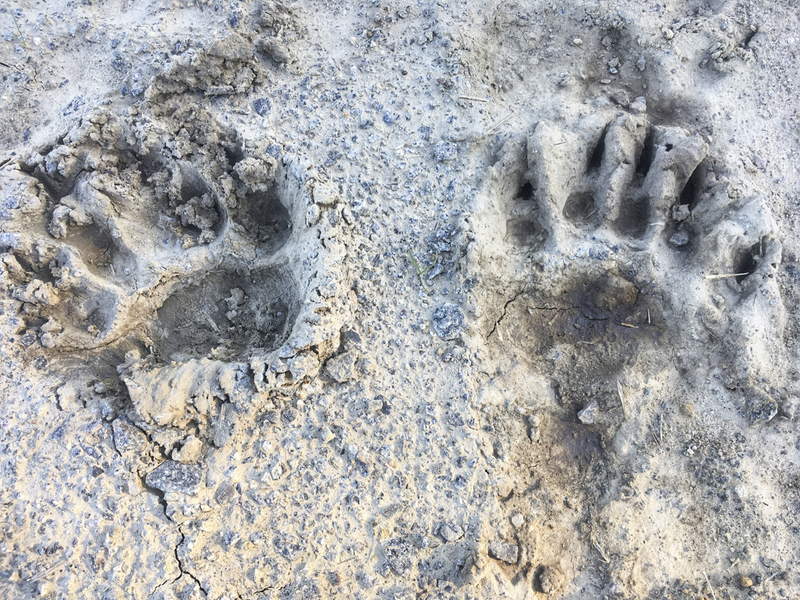 This would be our fate for this day of woods-walking and refuge road exploration – a total of 19 bears, all seen at a considerable distance. We did find three in a large tree, two resting and one playfully climbing up and down. 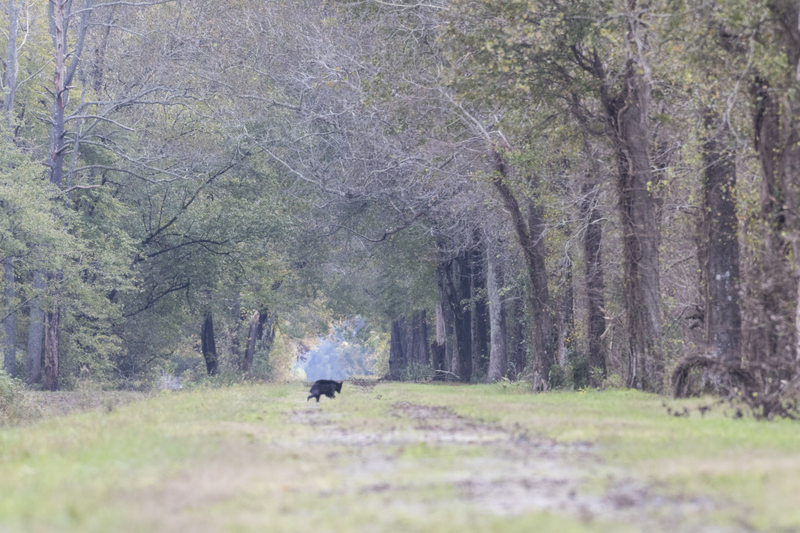 But most were headed to or from a cornfield, stocking up before the bitter cold of winter might cause them to go into hibernation (perhaps an abbreviated one that is more typical of bears in the Coastal Plain). We also witnessed some bad human behavior of people trying to get just the right photo and causing a bear to alter its choice of pathways (it is always best for the human to give way and let the bear go where it wants). 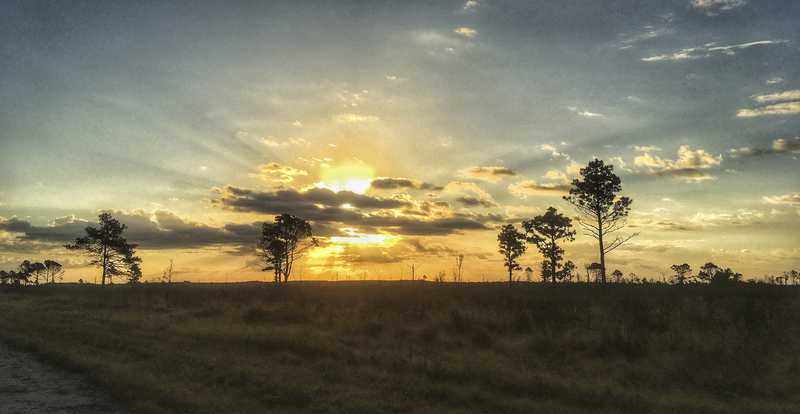 The day ended with a great horned owl calling against a flame orange sunset through the black branches of tree silhouettes…another beautiful Pungo day coming to a close. Our friends departed for home and we drove to our campsite at “nearby” Pettigrew State Park. We could hear swans flying over us to the lake all night indicating they are just arriving from their long journey. We spoke with people that had seen almost no swans two days before so it seems we were lucky enough to be there with the first wave of winter arrivals. We were awakened by some noisy campers at a ridiculously early hour, so we were out at sunrise, headed back to Pungo. The big sky of these flat lands is always a highlight at sunrise and sunset, especially in the crisp air of cold weather. A few flocks of ducks were mixed in with the swans, whose numbers grew to a few thousand by Monday morning. 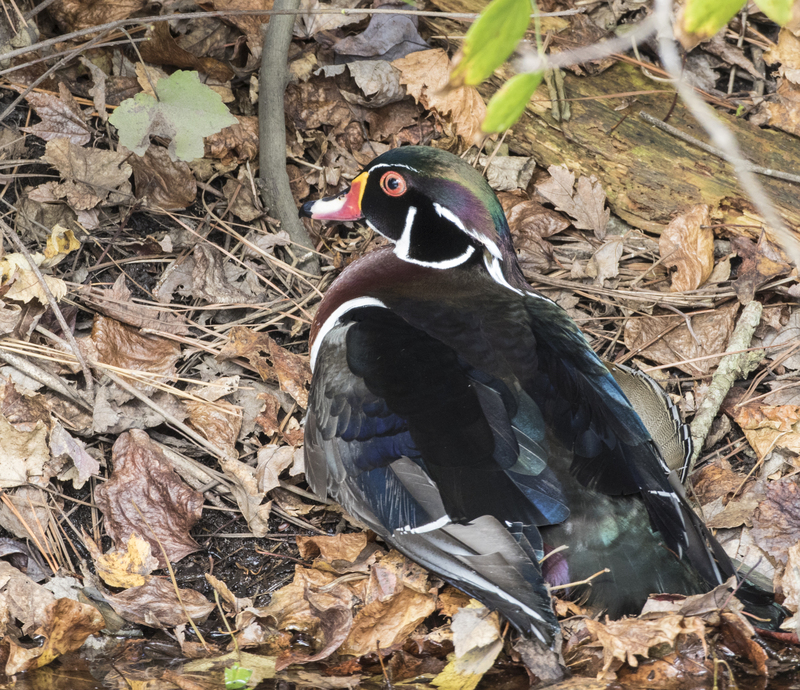 It is not unusual to see wood ducks in the canals along refuge roads as they flush in front of your car and zip through the trees. It is unusual to see one stay put after you spot it. I caught a glimpse of a stunning drake as I drove past it, so I stopped and backed up, fully expecting it to dart away (it seems no creature will tolerate a car that is backing up). One glance at its awkward posture and you could tell something was wrong. It shuffled up the bank a little when I stopped for a photo, so we drove on, sorry to see this beautiful bird in such a state, but knowing that some predator will probably get a meal. Driving over to Bear Road, we encountered another group of photographers hanging out, waiting for bears. There was also a phoebe debating the true meaning of a road sign…surely this doesn’t apply to me (I have seen many human visitors debating that same thing, unfortunately). So, we drove back over to Marsh A to fix our breakfast and to spend time watching the swans greet the day. 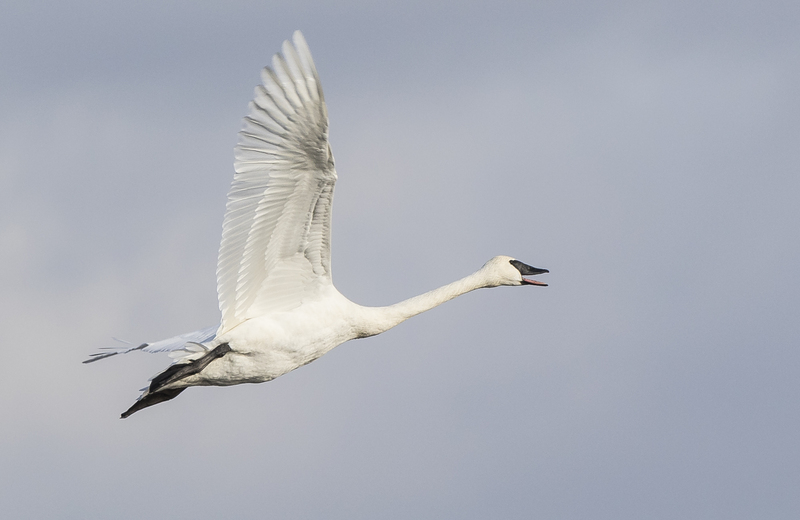 It wasn’t long until we heard a sound very different from the coos, whistles, and hoots of the tundra swans – the distinctive horn sound of a trumpeter swan. This is the swan species we see in Yellowstone (although less frequently in recent years) and are seeing now more regularly each winter here in NC. The past few years have brought a few of the larger trumpeters to Pungo and Mattamuskeet. The characteristic calls are by far the easiest way to locate a trumpeter in a sea of look-alike tundra swans. If they are standing next to each other, you can tell a trumpeter is larger, and, in this case, the call was coming from a flying bird, and we soon spotted it flying with a group of tundras. In flight, it is possible to see a size difference, but I don’t think I would really notice it unless I heard the call and was looking for it. Another clue to separate them is the head – look closely at the two photos of swans in flight. Trumpeter swans have a long, straight bill. The inner edge of the bill forms a rather straight line up to the eye, encompassing the eye so that it is difficult to separate from the black bill. The eye of tundra swans is more distinct as a circle separated from the bill. Plus, the inner bill line comes off the eye, and then drops downward. Most tundras also have a yellow spot on the bill below the eye, trumpeters do not. And a trumpeter has “red lipstick” along the inner edge of its black bill. After looking at the birds circling us and then comparing images, I think there were at least three trumpeter swans in the group, two immatures and the adult shown here. I hope we can spot them on the Christmas Bird Count next month! To learn more, check out this link for some of the ways to distinguish these species. We ended our trip just after lunch, with only 3 bear sightings for Monday, but plenty of memories to last until we get back in a few weeks. I really do love this time of year! 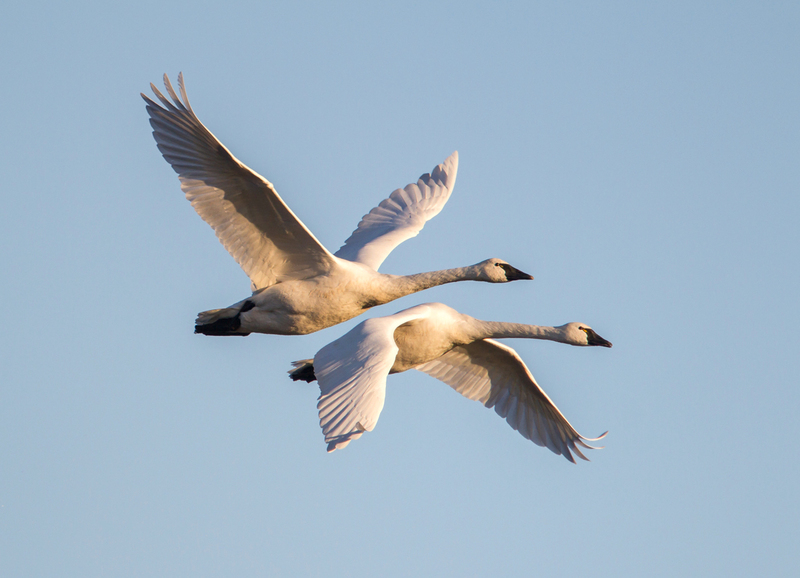 This entry was posted in Trip report and tagged black bear, pocosin lakes national wildlife refuge, pungo, tundra swans by roadsendnaturalist. Bookmark the permalink. Sounds like a cool place to hang out! It is most gratifying to know that the cycle of nature continues in spite of it all. When I lived in Edenton, I was always elated to hear the swans flying overhead on their way to the refuge. I miss that! Thanks for the sharing these photos. It has made my day!! You are welcome. I love their sounds. I am not able to hike or camp out to see these marvels. Thank you for your photos and memorable descriptions – you brighten my day! Thank you, Sandra. And you are certainly welcome. Do you ever offer this trip to other people? Without invading your personal privacy, I would love to go with knowledgeable naturalists, and learn. Hey Joan. Good to hear from you. I will start offering trips again in the winter of 2020 when I re-retire! Keep in touch. They are just arriving so peak numbers won’t be for a few weeks, generally early January. How do you stay safe with bears? Well, we try to respect their space and watch for any changes in behavior that might indicate disturbance. They tend to be pretty afraid of humans since they are hunted in that region, but allow our presence if we don’t get too close. We try to not block their way and allow them safe passage when they move. Respect them and you should be fine.